A week ago today, we were very much breathing a sigh of relief, as it finally, thankfully, ended a week-long stint of Miss Raegan not being able to eat a full meal/go a full day without urping. That is, two weeks ago today, she started her day by getting sick and then went a week straight getting sick at least once every day (and in the case of that Saturday night, many many times of icks). At first we feared flu but there were no other symptoms and she would randomly seem fine, only to get sick again later (and still randomly), which left us freaked out and confused and her totally wiped. We finally discovered on that aforementioned Saturday that she had an ear infection (her second in less than two months) and the drainage from that was upsetting her stomach. Poor baby girl! However, even once we knew what was going on, it took days for the situation to improve because she was so worn down at that point. Raegge’s never been a big kid, so imagine her going a week without a decent meal and you can about guess how many of her ribs I could feel when I gave her hugs and how lethargic she was: “Carry me to the couch!” she’d whine/ask as she sat at the table, 10 paces away, and she legitimately didn’t have the energy to do it herself. That is just not my kid! But finally she started keeping food down again, and with each day of this last week, we’ve seen her come back to herself more and more. One way I knew she was better? She started loving on Truman again. This photo is actually several weeks old now (and you wouldn’t believe how much both of them have aged in the weeks since), but it’s pretty telling of how much Raegan loves her littlest brother. And she suuuuuper loves to give him hugs and kisses and get right up in his business to tell him how cute he is (in a really singsongy baby talk voice, the origin of which baffles me). When she was sick, she wasn’t all over him (um, thank goodness! as that is good practice for contagious germ bugs! ), but this week? Oh, yes. She’s loving on him all the time. Another indicator? She’s been able to return to preschool! Last week we kept her home both days based purely on energy level and she didn’t even fight us (it was a short week; by Friday she probably could have gone, but not last M/W). 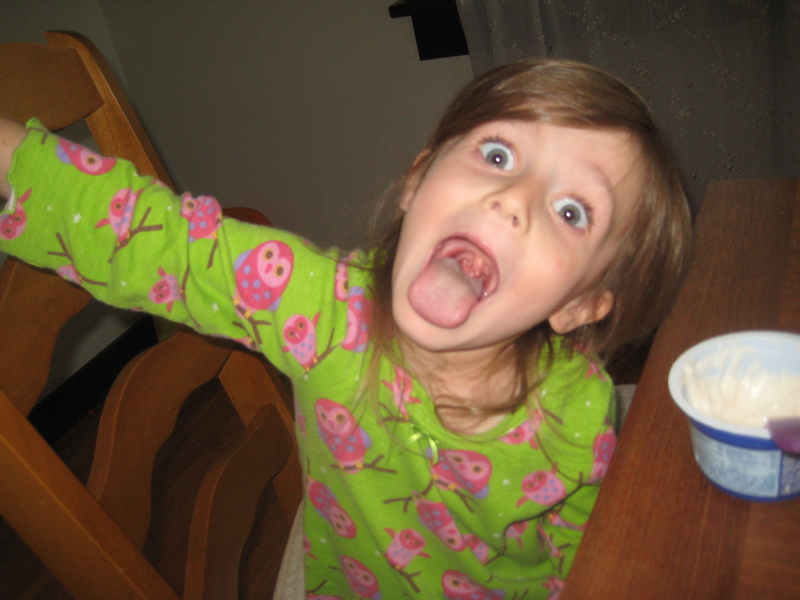 And goodness, does she seem to enjoy school. 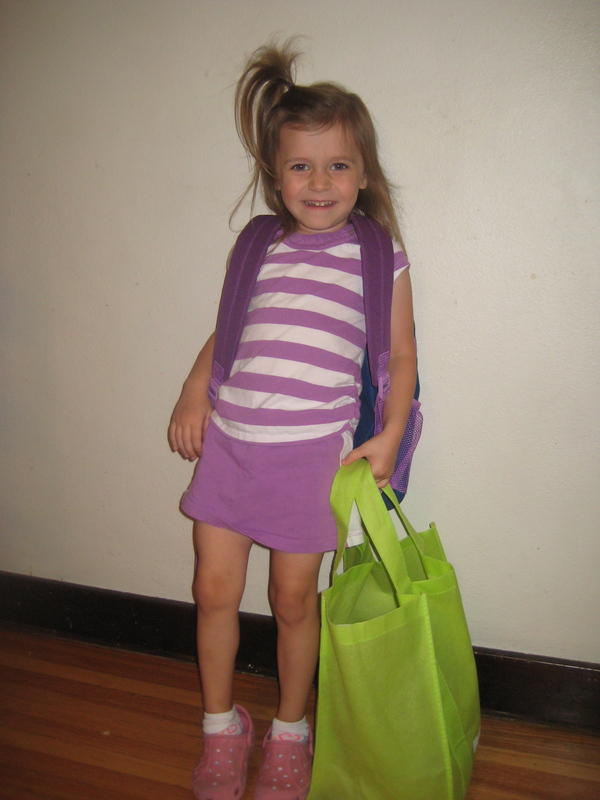 One highlight of RL’s preschool life thus far, was, of course, getting to be the Helping Hand. The first pic below is from her initial crack at it in September. It’s the day they get to bring snack and be, in her awesome version/wording, the Lean Lieder (get it? what it actually is, I mean?). She was super proud to be the helper, just as she is pretty much every day when she comes home. 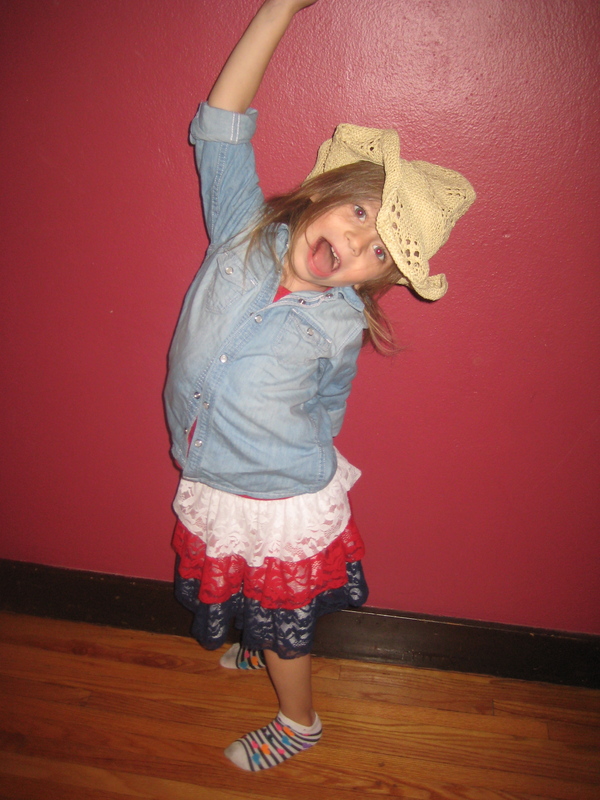 The second shot is from “dress like a cowgirl/cowboy day” and again, this isn’t exactly how Ben or I pose for pictures, so I guess we’ll leave it at this: her personality is awesome and we love to see it come out in various forms! 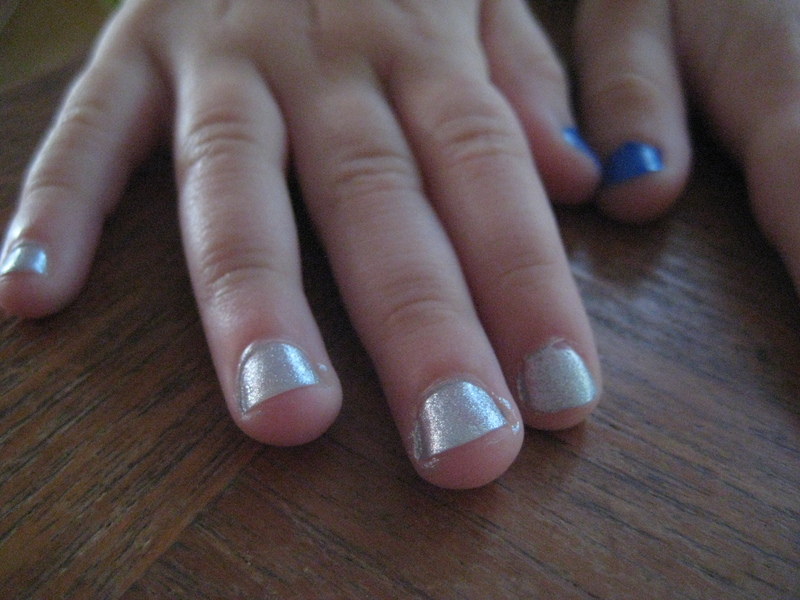 Also exciting in the world of RL is this: the first time we painted her fingernails! Because she actually had fingernails to paint! Yes, in all honesty, it has probably been two years since I have had to clip her nails because she’s been chewing on them, and never when I could see her (so, at night, I guess?) to try to get her to stop. We started talking about her not biting her nails at least a year ago and I kept telling her that we’d paint them once she quit it but it wasn’t until this fall that that actually worked. 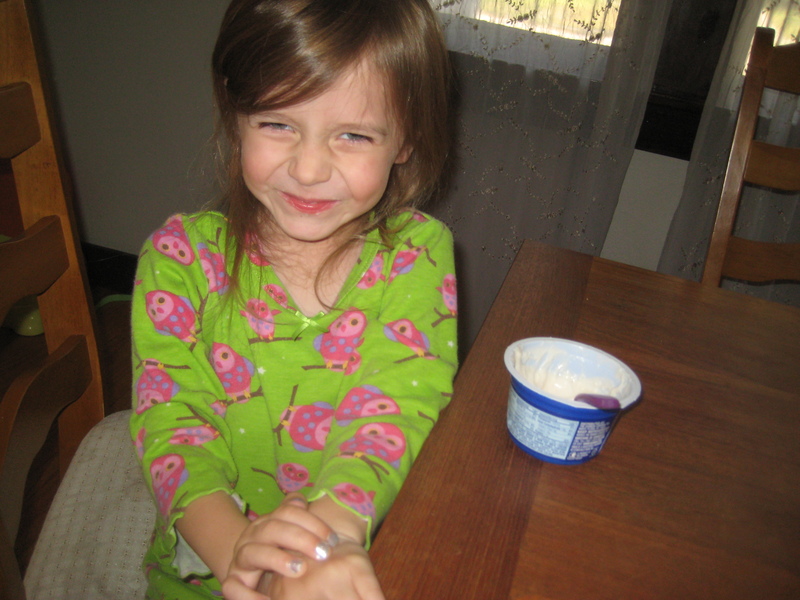 So I clipped and she picked the color(s – two blues) and I painted and then she made faces at me while they dried. Again with the personality, I tell ya. She’s the best! And just how long did it take for her nails to dry while she made these faces? If you ask her, she will probably tell you “150-12” minutes/days/years because somehow that made up number has become her favorite and she uses it all. the. time. In fact, I am pretty sure she has used it “one hundred fifty-twelve” times in the last month at least. So she may be losing her baby face and coming into her almost-four-year-old little lawyer ways, but dang if she doesn’t keep the ride interesting!